Is Congress Really A Co-Equal Partner? When I was a kid I remember my dad saying, “this family is not a democracy, the best you can hope for is a benevolent dictatorship”. He said it with a smile but my brothers and I got the message. We could participate in the discussion and voice our opinion, but in the final analysis my parents called the shots. We didn’t always agree, but they did control some key points of leverage, i.e. food, shelter, allowance, that made disagreement potentially more costly than it was worth. The fact is that we were not equal partners in the enterprise called “the family”. However, when our Forefathers wrote the American Constitution, they did, in fact, create three co-equal branches of government to protect us from even a “benevolent dictatorship”. They did so with the very real expectation that there would be a constructive tension between the branches, resulting in truly representative and equitable governance. However for this grand and brilliant scheme to succeed, each branch must play its prescribed role. If one branch in our system of government fails to function properly, the entire system is thrown out of equilibrium and that carefully conceived balance of power is placed in jeopardy. As in any system, when a void is created, it is necessary for that void to be filled to place the system back into equilibrium. 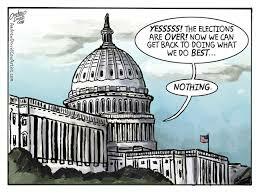 And so, as congress has created a void, we hear loud and angry complaints as other branches move to fill it. The Republicans, while purporting to be dedicated to our democratic way of life, are in fact using every tool at their disposal to subvert the very system in place to protect us. It is clear that the Constitution expects the Congress to legislate. Yet this Congress has done everything but legislate. They have attempted to prevent already passed legislation from taking effect. They have used every parliamentary tool at their disposal to prevent legislation from getting to the floor for a vote. They have investigated false scandals leading to no conclusion and even less action. They have accused both the Executive and the Judicial branches of overstepping their bounds. Yet, as I noted, when a void is created in the system, it will seek to right itself one way or another. Not only has the congress failed to fulfill its basic obligations, it has served as an obstruction to the smooth operation of government. It has gone so far as to cause the shutdown of all but our government’s vital services. In short, the Congress, rather than being a co-equal positive force in the governance of the United States, has been a destructive impediment to legislative progress. Anyone who has followed my blog over the past three-and-a-half years is well aware of the legislative sink hole the GOP has created. To name just a few of the key issues still awaiting action: gun control, immigration, tax reform, equal pay, minimum wage, and marriage equality. What is most troubling is the fact that their inaction does not represent the desires or opinions of the nation. It is clear that the GOP has become the servant of the few with narrow self-serving interests. Instead of aspiring to raise us to new and greater heights of equality and understanding, they seek to find the lowest common denominator of ignorance and hate. There has been much said and written about the so-called “imperial presidency”. However, as long as the Congress refuses to accept its role as defined by the Constitution, they can only blame themselves for an Executive Branch that has assumed greater and greater power. By doing so they endanger our democracy and our future. It is time for Congress to assume its rightful place as a co-equal branch of government. If the current membership won’t, we must elect others in 2016 who have the courage to act on behalf of the entire country, rather than the narrow and selfish needs of the few. The future of our democracy depends on it.